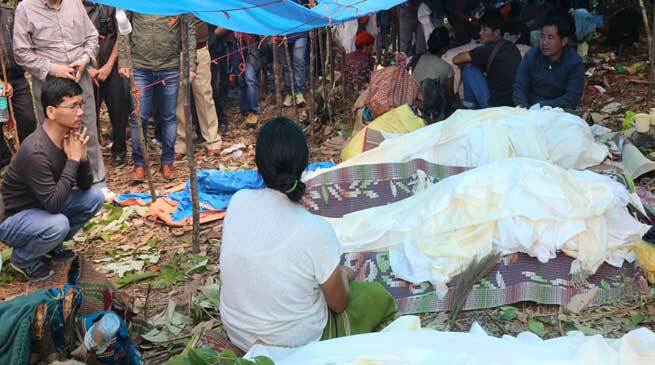 Chief Minister Kalikho Pul today met the relatives of the Sunday’s Bolero Pickup car accident victims that fell from a cliff more than 300 metres below, near Betchiling village as the death toll from the accident climbed to 15. The Chief Minister expressed “deep shock” at the incident and stressed that the visit to the accident site “is above all else, a sign of respect for the victims, the bereaved families and on humanitarian ground”. He had walked down the hills 200 metres below the road to meet the victim’s family who were preparing for a funeral pyre for the cremation of the dead. The bodies of the victim had been retrieved from the cliff and were assembled at the funeral site. Also revealing his findings from the accident scene – a spot 11-km from Kalaktang town, the Chief Minister said that whenever roads are cleared for landslides, it should be wide enough for easy manoeuvre. He pointed out that the accident spot was a narrow stretch recently cleared of a landslide. It is a bad practise to clear roads with such narrow passage that makes the spot accident prone, said the CM and urged the administration to start immediate work for widening of the narrow stretch. The CM personally attended to all the relatives of the dead victim who sat next to the bodies that were being prepared for last funeral rites. He spent about 2 minutes with each family member sharing their grief and sadness, and hugged them to console. Overwhelmed, the family members shed their tears. The Chief Minister handed over cheques of Rs 4 lakhs to each victim’s family and assured additional Rs 2 lakhs from the Chief Minister’s Relief Fund to be handed over through the district administration. For the one injured, the CM had earlier announced Rs 2 lakhs. Later, it was revealed that the injured had succumbed to her injury in Guwahati hospital and had died. As ex-gratia relief, the Chief Minister handed over additional Rs 2 lakhs to the next of the kin and assured another Rs 2 lakhs from CM relief fund. Also the CM donated Rs 5 lakhs through his personal source towards the contribution for the last funeral rites. As mark of respect, a two-minute silence was observed in honour for the dead. Power Minister TN Thongdok who accompanied the Chief Minister to the funeral site, appreciated the CM’s noble gesture. RWD Minister Kumar Waii, Mechuka MLA Pasang D Sona, Seppa East MLA Tapuk Taku, Chayang Tajo MLA Karya Bagang, Bomdila MLA Japu Deru and PPA President Kahfa Bengia accompanied the Chief Minister during the visit.